Everyone gets angry at times—children and adults alike. Anger is an emotion that can range from slightly irritated, to moderately angry, to full-blown rage. And it can happen quickly. A child’s anger naturally makes us feel uncomfortable. As a result, we may try to appease our child, give in to their demands, or avoid certain situations so that their anger goes away. Alternatively, we may “bring down the hammer,” to put a stop to the anger through intimidation or punishment. In short, we get angry at their anger. The fact is, your child will experience situations that may trigger anger throughout life. You can’t stop the triggers, but you can give your child the tools to understand his anger and how to deal with it in an appropriate and reasonable manner. You can’t control your child’s emotions—and that’s okay. Emotions are normal—we all have them. But you can expect your child to control their behavior. It’s okay and natural for a child to be angry at times, as long as that anger is expressed appropriately. A child’s rage will often trigger a parent’s own emotions. How do you usually handle it when people are angry? Some people are very uncomfortable with anger—it makes them anxious or fearful. For those of us who grew up in homes where anger meant shouting and danger, your child’s anger may push some of your emotional buttons. If you aren’t aware of your own issues, you could respond in ways that are actually a disservice to your child (such as giving in to what they want or yelling back). If you start experiencing intense emotion yourself, take a breath and a mental step back. One trick is to picture your child as a neighbor’s kid. This can give you a little emotional distance. Also, understanding where you are at with your ability to control your emotions can give you empathy about where your child is in developing this skill. It’s not easy—it takes discipline and practice. And remember, our kids are new at this. Make sure your responses don’t escalate the situation. Just because you choose not to argue with your child doesn’t mean you’re giving in. Give your child some space and time to cool down. If he’s screaming at you, it’s okay to wait to give a consequence. The time to say “That’s disrespectful! You’re grounded!” is not in the middle of an emotional tsunami. You can always hold your child accountable later on when things are calmer. There are physical signs of anger that your child can start to tune into: stomach clenching, a feeling of tension, feeling flushed, clenching teeth. Sometimes when we’re angry, we actually hold our breath without realizing it. If your child can notice these signs early on, it can keep anger from escalating to rage. An ounce of prevention really can be worth a pound of cure. When you are both calm, talk about the incident. Many kids will experience or express true remorse after having an emotional meltdown. If he’s open to talking and willing to learn anger management skills, you can help him work backward from the incident. What happened right before the rage was triggered? What was said? What was he feeling? Embarrassment, frustration, disappointment, fear, anxiety? There is always another emotion underneath the anger. Learning to recognize underlying emotions is a powerful tool your child can use throughout life. A word of caution: many kids, particularly those with oppositional defiant disorder, are not willing or trusting enough to explore this with a parent or therapist. If you make an effort to brainstorm solutions and he resists, drop the subject and see if you can come back to it at another time. Then help your child identify more positive ways he can express his emotions. The way your child perceives a situation is at the heart of anger. However, you may want to keep a calendar on her mood if it seems things are escalating. Does she tend to be more irritable if she doesn’t get enough sleep, skips meals or has poor eating/snacking habits or otherwise isn’t feeling well physically? Adolescence is well-known as a time of higher irritability for kids. This isn’t an excuse for negative behavior but it can explain why “little things” seem more irritating at different times. 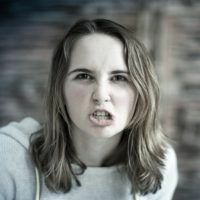 Some parents worry because a child’s anger is beyond what they would consider “typical.” While it’s true some children exhibit explosive rage, you can still use the suggestions above to deescalate a situation. If your child’s anger is extreme, you may want to seek counseling. Even if your child won’t participate, you can go yourself to get support and guidance. No matter what degree of anger your child exhibits, the fact is, he is still responsible for managing that emotion. And remember, it’s a learning process. It doesn’t happen overnight, but with support and encouragement, you can help your child continue to strengthen coping skills. That’s because her son sees almost everything his mom says as an effort to control him. Intermittent explosive disorder (IED) is another diagnosis parents may hear from mental health professionals. It means a child (or adult) is having episodes of intense rage that result in behavior such as screaming, throwing or breaking things, and aggression toward others. This diagnosis is marked by episodes of anger that come and go (intermittent) and are intense or severe (explosive). The episode may appear to come out of nowhere, and the individual has difficulty managing the intense emotion. The techniques above are particularly important for ODD and IED kids. But remember, no matter the diagnosis, your child is responsible for his own behavior and should be held accountable for his own behavior.